Info Updated 4/28/12 — basic yardage info added and general rules – please read all of it if you plan to participate so we don’t have to repeatedly answer questions that are included here. Thanks! We’re looking forward to getting started on this project. Please click on the info in the top bar for the yardage and rules. Please click on the link for July at the bottom of the write up. 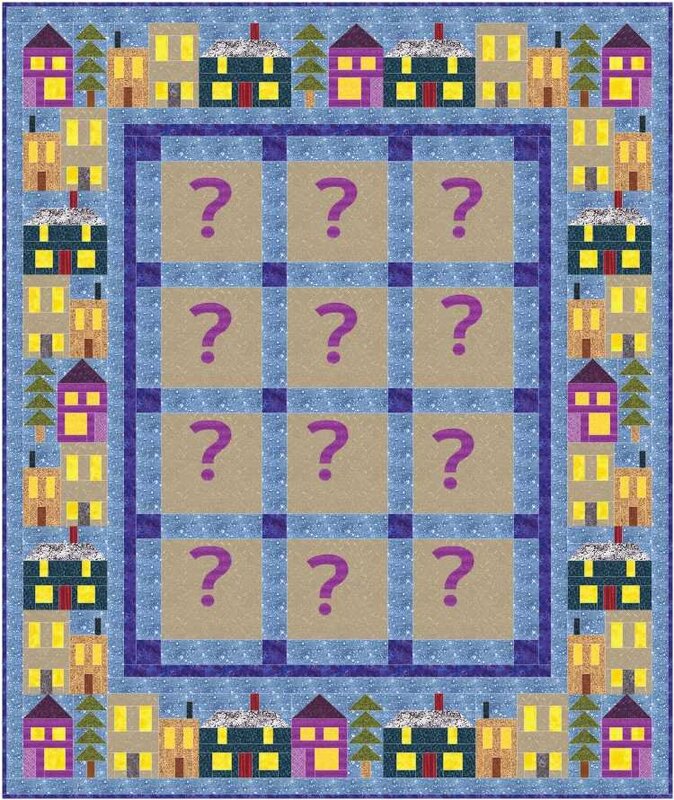 This project is being offered as a Block of the Month, where the center will be Mystery blocks revealed monthly and which you will collect through Blog Hopping our blogs! Denise designed this great batch of border blocks while Judy, Sheryl and I will be designing the center blocks to replace the question marks. Each month you will need to visit each of our blogs to collect our latest block revealed for that month. Instructions will be in pdf format download only. The final instructions to set everything all together will be posted on Denise’s blog in November. So start in July, finish in November, on your bed in December! Yardage for the background in the border sections and plain borders will be posted in June. Yardage for the other fabrics used throughout the quilt will not be given as this is a great scrap friendly, stashbusting project. You’ll have fun choosing the necessary fabrics from your stash to make each block uniquely yours. Please plan to join Denise, Judy, Sheryl, and I in making your own special Christmas Town Sampler. The quick links to my blocks are below! ENJOY! Claudia, the instructions won’t be released until July…and then you will ned to visit all 4 web sites given to receive the patterns. thanks for your interest! no. Just go to the Christmas Town sampler link at the top of this blog. You’ll find all the information and links to Denise, Judy, and Sheryl’s blogs. has the august block been posted yet,I can’t seem to find it. Click on the Christmas Town Sampler on the blog header. Down at the bottom is a direct link to the pattern. I posted it on saturday, July 4 in the early AM, there’s a story about the block with a link at the bottom of the post. Enjoy! The poinsettia link doesn’t work. I’ll try again later. I can’t seem to link to the october block. I can’t seem to bring up the poinsettia block either. i’ll give it a try later. i CAN bring up the other blocks, though. you might want to take a peek at it. thanks so much for doing these blocks. i love the whole quilt idea. you ladies rock! Ladies, I don’t know why the link in the top heading isn’t working. Please pull up the Saturday post POINSETTIA and go to the bottom of the post. There is a working link there. Hi Susan, how do I pull up the Satirday post please? Hi again Susan, I found it – I was looking a thre wrong Saturday. Thank you so much for all his work you do on behalf of us quilters. Thank you Susan and thanks so much for doing this CTS. I appreciate all the hard work you four put into this fun project. Thank you so much! I am trying to get the October Christmas Town Sampler, the link do not work at the moment. will take you to the proper post. At the bottom of the post is another link for the pattern. Hi, Sorry to bother, I have been checking my files to make sure I have all the patterns so I can start my Christmas town quilt, and found that I still am not able to get the October block from your list. The link is bad, and I know you have more to do than fix my problem, but I would really like to have that block in my quilt. Can you or should I say do you mind helping me? Many thanks for all of your work on this quilt, I have loved reading the in put from all of the designers. I am sorry to have had this problem. Thank you for the great Christmas Quilt. Have enjoyed following the 4 blogs and collecting the blocks each month. just want to say Thanks to you for taking time to design such a beautiful quilt, and for sharing it with everyone else. I wish all of you a very Merry Christmas and a safe and prosperous New Year. Was there a post for Christmas Time Sampler? I know you all have had some horrible weather but was wondering if I missed the Nov posting and final instructions? Denise has not released the November instructions yet. Hang in there, lol…they’re coming! For some reason I am unable to open your fourth block. Have been trying since October and everything else opens, but the 4th one always goes to the Cannot Display this Page. Is there some way you can help me obtain it? Thank you. Much appreciated. Sorry, Susan. Ignore this post. The idiot in me cannot read. I found it and got it downloaded. Thank you so much for your contribution to this beautiful quilt.